Being a bilateral disease, visual pathways in LCA2 patients on both sides are atrophied due to lack of visual inputs. After reinstating vision by injection of good copies of the gene, visual pathways from the injected area to the brain strengthen over time. 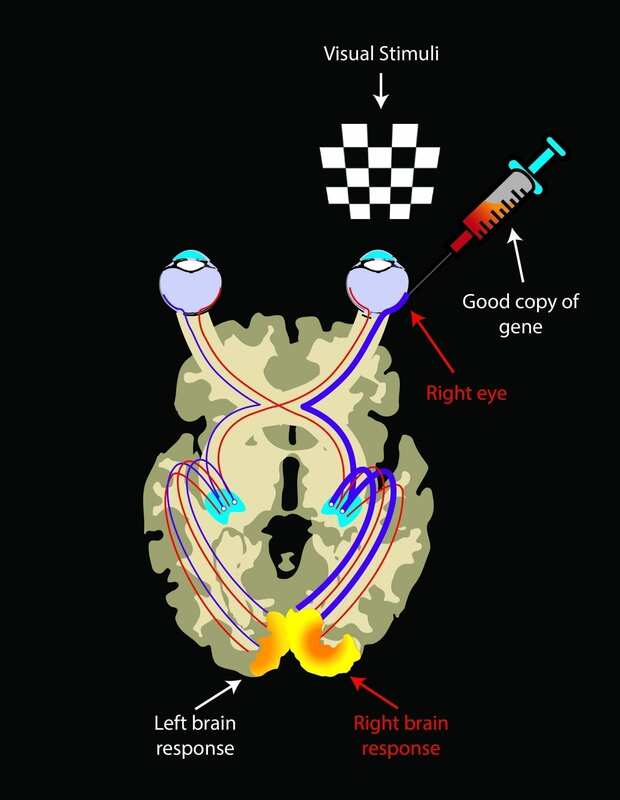 Hence there is an asymmetrical brain response showing much larger activations in the retina-brain pathway from the injected eye when each eye is exposed to visual stimuli. “That was what we expected to see— the more the treated eye sees the world and interacts with the environment the more it stimulates the pathway and the stronger the connecting pathway becomes between the retina and the brain,” said Ashtari. Ashtari also found a strong hint in the data that the treated-eye pathways tended to be in better shape when more time had elapsed since the treatment, implying that these pathways continue to improve with use. By contrast, the untreated-eye pathways showed a clear decline with time. March 13, 2019 - YOUR HEALTH: A gene therapy that has restored eyesight to children with a rare genetic disorder WQAD MolineA new gene therapy treatment is giving children blinded by a genetic disorder a chance to see. This Gene Therapy Can Restore Vision, but Will It Break the Bank?